Back in 1999 Penn State climate scientist Michael Mann released the climate change movement's most potent symbol: The "hockey stick," a line graph of global temperature over the last 1,500 years that shows an unmistakable, massive uptick in the twentieth century when humans began to dump large amounts of greenhouse gases into the atmosphere. It's among the most compelling bits of proof out there that human beings are behind global warming, and as such has become a target on Mann's back for climate denialists looking to draw a bead on scientists. Today, it's getting a makeover. 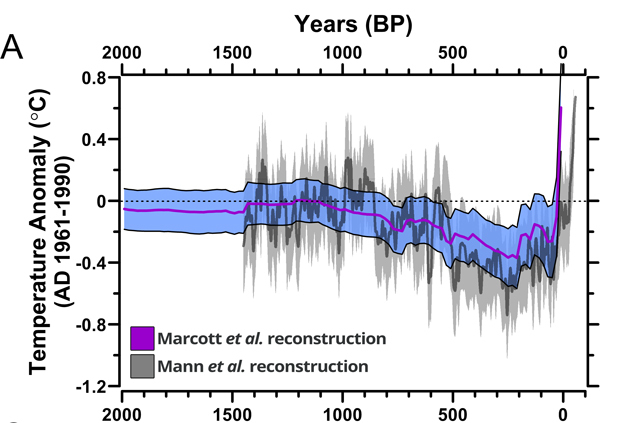 A study published in Science reconstructs global temperatures further back than ever before—a full 11,300 years. 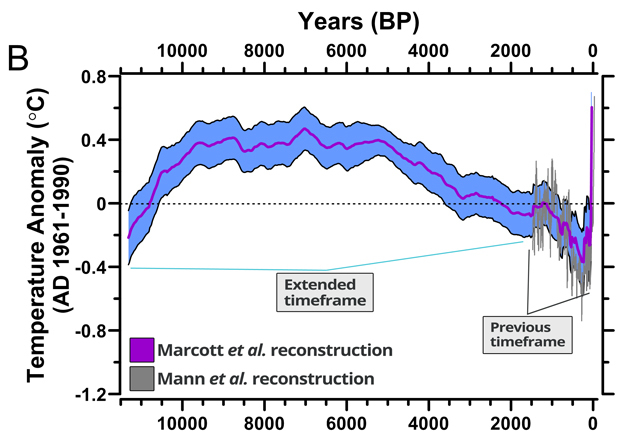 The new analysis finds that the only problem with Mann's hockey stick was that its handle was about 9,000 years too short. The rate of warming over the last hundred years hasn't been seen for as far back as the advent of agriculture. Notice how gradual climate change in the past was. Organisms had a chance to adapt. Not now. Last edited by jpn; 03-08-2013, 09:45 PM. Organisms like the Dinosaurs and Wooly Mammoths? Organisms like the Dinosaurs and Woolly Mammoths? Huge Meteor strikes may have accounted for the dinosaurs, but the time-frame here is 11,300 years, there were no dinosaurs in that period. And over hunting is a reasonable explanation for the woolly mammoth, but even if it was the onset of the Ice age, it doesn't change the chart. Alligators, Crocodiles, Sharks, Komodo Dragons... actually there are still a lot of Dinosaurs around. Birds have been proven to be descendents of some Dinosaurs... looks like they adapted. The term ‘climate change’ is a bit of redundancy in terms of the earths past in the sense that the climate changes by its very nature. If the earth is billions of years old, whatever influence man will have on the climate, it’s practically a certainty, that a nearly identical set of climate conditions existed in the past. And it’s equally certain that whatever critters were around at the time, adapted to it, and got along just fine. Where is your faith in evolution? What you are suggesting is a climate cataclysm such as what happened when [they suppose it happened, anyway] the large asteroid struck the earth and took out T. Rex and co. If you look at the ‘consensus’ even those scientists who agree that AGW is a real phenomenon, typically concede that there will be trade-offs in the sense that, even though there could be coastal flooding, they will be growing cantalopes in Denmark. Assuming, of course, they are right about AGW. In either event, the vast majority of species will adapt to it and the ones that don’t will die and get out of the way. That is the way evolution has always worked, right? Not to mention the fact that we might just put off the next Ice Age by as much as 50 years. You are being a tad too literal here. I was pointing out not every organism adapts to every change. The chart is also showing me if AGW is true, it's saving our civilization, we do tend to do well when we can grow food we can eat. Oh it could be better than that... and the NYT has the story! Hey jpn, notice how the temperature was as high or higher around 7,000 years ago. What were the CO2 levels back then? So ask yourself this, how did the Earth get as warm as today when the 'control knob' was set to 260 ppm? And how is it that global warming has paused for 17 years when the control know has been turning exponentially higher each year? Did you see the thread I started that has a PNAS paper that says "anthropogenic global warming trends might have been overestimated by a factor of two in the second half of the 20th century"? Hey Kramer, still trying to use local temperature changes to dispute global temperature changes? So ask yourself, when was the last time atmospheric CO2 was near 400 ppm? Still pedaling the myth that it hasn't warmed since 1998? Not yet, but I'll take a look. As irrelevant as this question is, the more significant question is what was the temperature when the CO2 concentration was last 400 ppm? That would have been around 3 million years ago, during the Pliocene. CO2 levels remained at around 365 to 410 ppm for thousands of years while global temperatures were 3 to 4°C warmer than pre-industrial temperatures and sea levels were around 80 feet higher than today. Now remind me how good humans had it back then. You mean back when our ancestors went from beast to tool-users and fire tenders? Seems like our pre human ancestors did well in using their minds to adapt. So, you are saying that lower co2 levels resulted in higher temps?